Bring refreshment and relaxing aromas to your home with this fragrant sampler candle from Yankee Candle. Crisp gingham curtains are fluttering in a warm breeze and a freshly baked fruit pie is cooling on the window sill. The oven is still hot after a batch of baking and the air is filled with the fragrance of cinnamon and spices. The kettle has just boiled and a pot of tea is brewing. 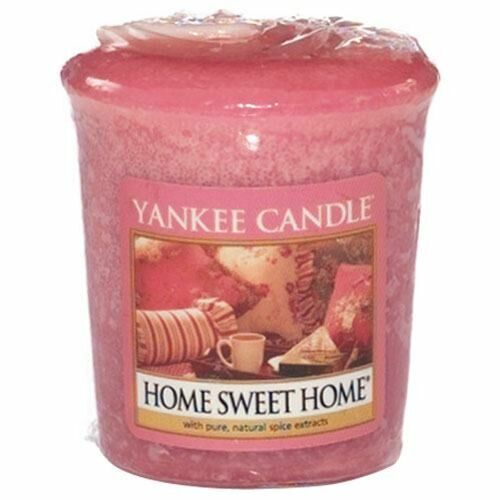 The heart-warming scents of home are invoked by this Yankee candle which has the pinkish purple colour of lightly simmered rhubarb and apple. This Samplers Votive candle has a burn time of up to 15 hours and is perfect for fragrance layering, as well as sampling new scents. A fabulous gift for a friend or a treat for yourself. A fabulous gift for a friend or a treat for yourself.